presentations, demonstrations, and lecture series. Veterans’ service organizations, military service organizations, and other reunion and service groups are encouraged to get involved in the Campaign by raising awareness and contributing funds to the National Museum of the U.S. Army within their ranks. See the current listing on the Veterans’ Hall Donor Wall. For contributions ranging from $2,500 to $500,000, Veterans service organizations and other groups that support the United States Army will be able to have their name listed on the Veterans’ Hall wall and receive other corresponding recognition benefits. Your organization’s name will be displayed in the Museum’s Veterans’ Hall and recognized in a special book published after the dedication ceremony. Your organization will also receive an official Campaign Banner and Certificate. Your organization will receive the benefits above, plus a beautiful signed and numbered print by nationally known historical artist Don Troiani. Your organization will receive the benefits above, plus an invitation to a special VIP reception with top Army officials and leaders of the Museum Campaign. Your organization will receive the benefits above, plus free access to the Veterans’ Hall for a meeting, reunion, or event within two years of dedication, and acknowledgement on our website and in the Call To Duty newsletter. Your organization will receive the benefits that accompany gifts at the $25,000 giving level, plus benefits at the major donor level which include your organization’s name placed in the One-Star Circle of Distinction on the Donor Wall in the main entryway of the Museum, VIP invitations to Campaign events throughout the year, personalized tours of the Museum upon opening; and announcement of your organization’s support through a press release and announcements in the Capital Campaign’s newsletter, the Army Historical Foundation’s quarterly magazine, and on the Foundation’s web site. Your organization will receive the benefits above, plus benefits at the major donor level which include your organization’s name placed in the Two-Star Circle level on the Donor Wall in the main entryway of the Museum and in event program materials, and a special opportunity for a check presentation. A quarter-page article on your contribution will be included in Campaign and Foundation publications and posted on the web site. 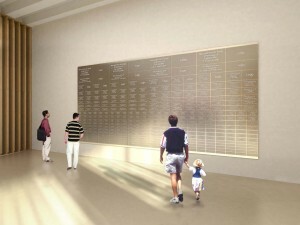 In addition to the benefits above, benefits at the major donor level include your organization’s name at the Three-Star Circle level on the Donor Wall in the main entryway of the Museum, in event program materials, and your organization’s logo will appear alongside its name on the Veterans’ Hall Wall. A half-page article on your contribution will be included in Campaign and Foundation publications and posted on the web site, with your organization’s name also hyperlinked on the web site. In addition to the benefits above, benefits at the major donor level include your organization’s name at the Four-Star Circle level on the Donor Wall in the main entryway of the Museum and in event program materials. A full page article on your contribution will be included in Campaign and Foundation publications and posted on the web site. Your organization’s name and logo also will appear on the Veterans’ Hall Wall and you will receive public acknowledgement at, and VIP invitations to, significant Campaign events (in many cases this will include special seating and access), including the groundbreaking and dedication ceremonies, and other occasions ranging from intimate major donor gatherings to large grassroots events for Soldiers and veterans.